Your joints are constantly moving. That is the nature of their job. 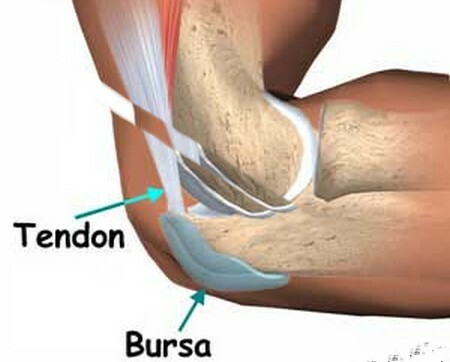 But because a joint is made up of hard bones and relatively soft tendons, the friction between them could cause some real damage if nature didn’t give you some protection — namely, the bursa. Bursitis occurs when this bursa swells up, usually in the shoulder, elbow, hip socket, kneecap, or ankle joint. You may have injured yourself recently, or perhaps it’s those years of dedicated running that abused your joints and set off your bursitis. Rheumatoid arthritis or gout can cause this condition as well. Rest. Since overuse probably had something to do with your attack of bursitis, resting the joint will go a long way toward fixing it. A few days of being a couch potato will give the swollen bursa a chance to heal. Then get off the couch. Rest is good for a few days, but don’t get used to it, or your joints will stiffen up. Stand up, change positions, walk around — just get moving. Cool it down. If you are experiencing intense pain, try an ice pack or gel-filled cold pack. Never apply ice directly to your skin. You may give yourself a case of frostbite and damage your tissues. Relieve the pain. Take aspirin or ibuprofen to relieve pain and bring down the swelling. Acetaminophen (Tylenol) won’t help the swelling, but many people combine it with the other two. Check with your doctor first. Sit up straight. You probably thought no one but your mother would say that to you, but experts agree that good posture is better for your joints. So, shoulders back, head up, back straight, and … smile. Do’s and don’ts. Toss the high heels to the back of the closet. You need comfortable, cushioned shoes that support your leg and place less stress on your joints. Avoid climbing stairs, if possible, and opt for the short walk around the block rather than the trailblazing hike. Bursitis has no cure, but with common-sense treat­ment, you can live a normal, relatively pain-free life. Assess your activities. Did you overdo it a bit dur­ing your last golf game? Are there other activities that set your bursitis off? Think about what you do regularly that makes you uncomfortable. It may be time to adjust your lifestyle. Yoga, walking, swimming, and gardening are all excellent activi­ties that will gently work and stretch your body. Pain IS no gain. Forget the drill sergeant routine. It shouldn’t hurt. When it does, stop. Normal, slow joint movement is good therapy for bursitis and will gradually make your hip more flexible and movable. Check your weight. If you are carrying extra pounds, you’re placing extra stress on your hips and other joints. Consult your doctor and begin a sensible weight-loss program.